Badaling is the most representative and magnificent section of the Great Wall of the Ming Dynasty. It has been open to the public the longest (since 1957). It is easily accessible and has easy walking conditions. it has been visited by 372 state leaders and VIPs, including presidents Nixon and Reagan, Prime Minister Thatcher, and Queen Elizabeth II. Eating: Badaling Hotel Restaurant, McDonald&apos;s, Yonghe King, Great Wall Commune Restaurant, and Jindian Friendship Restaurant. 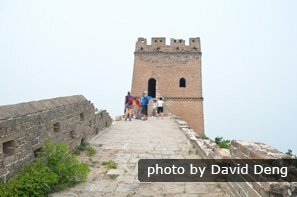 Hotels: Badaling Hotel and Great Wall Commune. Badaling is about 60 km northwest of central Beijing. It&apos;s 9 km up the valley pass northwest of the Juyong Pass Fort. Badaling&apos;s Great Wall section stretches 7.6 km across the mountain ridges of the pass from the Shixiaguan section in the south to the Shuiguan section in the east. Badaling commands a strategic position, once the first line of defense on the main pass between Beijing and the Mongol tribes north of the Great Wall. The first Mongol emperor marched through Badaling with his army to take Beijing and begin the Yuan Dynasty, which preceded the Ming Dynasty (1368–1644). The Great Wall at Badaling was completed in 1505 (the 18th year of the reign of Hong Zhi, an emperor of the Ming Dynasty). 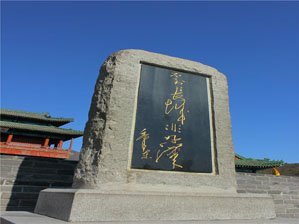 This section&apos;s construction was led by General Qi Jiguang, famous for defending China from Japanese pirates. "He Who Has Never Been to the Great Wall Is Not a True Man"
This section has a stone engraved with "不到长城非好汉" (&apos;not arrive Great Wall not good man&apos;), a famous line from one of Mao Zedong&apos;s poems, commonly translated as per the above heading. Continuing the theme, the highest point of this section is called &apos;Good Man Slope&apos; (好汉坡 Hǎohàn Pō /haoww-han por/). 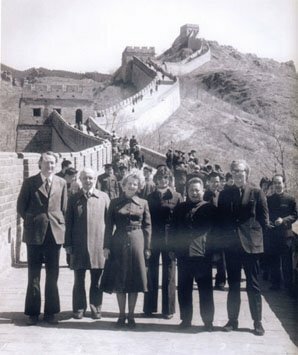 About 370 state leaders and VIPs, including presidents Nixon and Reagan, Prime Minister Thatcher, and Queen Elizabeth II, have climbed Badaling and admired the magnificence and beauty of its scenery. Dimensions: 7.6 km (4.7 mi) long. The wall is on average 7.8 meters (26 ft) tall and 5.7 meters (19 ft) wide, which allowed five horses to gallop abreast and ten men to march shoulder to shoulder. 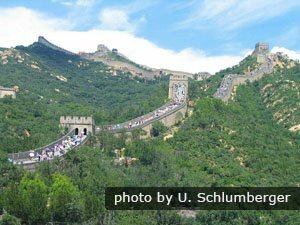 Comprehensive Facilities: Badaling has the most comprehensive facilities of all the Great Wall sections, including a circular-screen cinema, Great Wall Museum, shopping and dining facilities, as well as barrier-free access for the disabled. 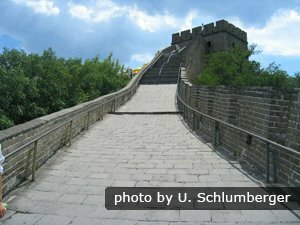 The main access paths, steps, and wall top of the Great Wall at Badaling are well paved with granite slabs, and handrails have been installed each side of the wall. Therefore walking conditions pose no significant risks, though there are some steep steps. Dirt paths up from around the cableway station to North Fifth Tower and North Eighth Tower are well worn, but may be slippery after rain. 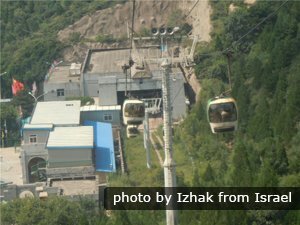 The cableway will lift you to the highest tower of Badaling, North Eighth Tower, at the top of &apos;Good Man Slope&apos;. The cable car station is in the north of the parking area. The slow roller coaster (滑车 huáchē /hwaa-chur/ &apos;sliding car&apos;) can take you down from North Fourth Tower to the valley, surrounded by Badaling&apos;s north towers, or up. Cars are pulled up on a railroad through a tunnel, and go down on a track as a train controlled by a staff member in the front car. It doesn&apos;t offer much of a view, and riders are shielded from the sun (and rain) most of the way down by a light blue plastic canopy. North Eleventh Tower is a 300 m walk up from the valley station, which is 400 m (¼ mile) northeast of the Badaling bus stop. The Badaling Section is well developed and you can find many restaurants and a KFC around the entrance areas. There are also many small inns in the villages around Badaling. March–May and September–November are the best times to visit the Great Wall. July and August, when Chinese children and students are on holiday, are also very busy. Read more about When to Visit the Great Wall. Dress for walking and dress for the weather. Choose comfortable footwear with good grip and support for the feet. Layers of clothes that can be taken on and off allow for greater comfort and temperature control. Badaling is about 80 km (50 miles, 1½ hours) by road northwest of central Beijing. All buses stop 400 m southwest of the valley-bottom rollercoaster station, not at the main parking lot entrance with the cableway, another kilometer west. First bus (from Deshengmen): 6:00 am. Last bus (from Badaling Great Wall): 5:00 pm. Deshengmen is about 5 km northwest of the Forbidden City, a ½-km walk east from Jishuitan (积水潭) Exit A on Metro Line 2. If you go to the Ming Tombs in the morning you may find Badaling less crowd in the afternoon, as most tour groups do the two the other way round. If you don&apos;t want to take a crowded public bus, Beijing Tourist Hub (北京旅游集散中心) has direct coaches to Badaling for 100 yuan; children under 1.2 m ride free. There are many fake buses claiming that they go to Badaling, even at Deshengmen showing 877, or at the Beijing Tourist Hub entrance, and which look like true buses. The drivers will ask you, "Badaling?" 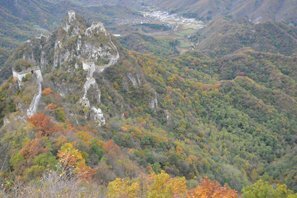 But they will take you to expensive shops, Shuiguan (a section of Great Wall next to Badaling&apos;s), and other places that waste your time and money. So please don&apos;t be cheated. 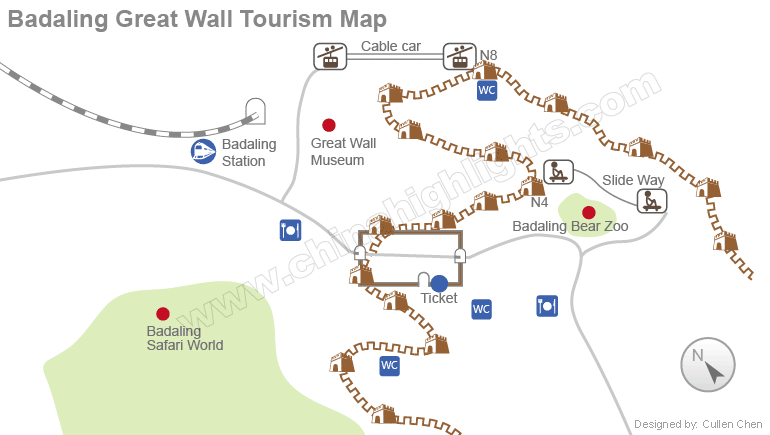 Advoid the crowded Badaling section and enjoy a pleasant Great Wall tour in other sections. 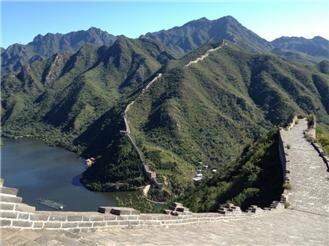 If the tours above aren&apos;t what you&apos;re looking for, you can tell us your interests and requirements, and we will help you design your own Great Wall tour. 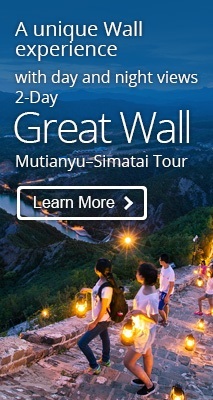 And if you are interested in Great Wall hiking, see our Wild Great Wall Hiking Tours.